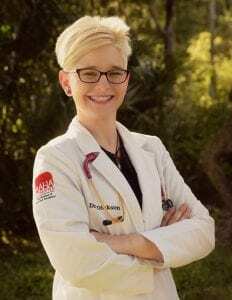 Dr. Davis (or Dr. Sara…whatever you want to call her!) was born into the veterinary profession, as both of her parents are veterinarians. She narrowed down her job search at the ripe age of three years old to: Veterinarian, Lawyer, or Ballerina. Needless to say, this has been a profession that she has known and loved for a long time! 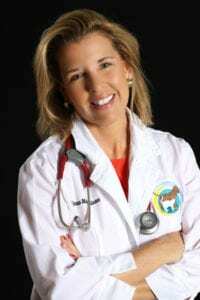 Dr. Davis grew up with quite the array of animals over the years, but she has since concentrated her veterinary interests to cats, dogs, and pocket pets (basically, anything furry that you commonly find in a pet store). Dr. Davis is a Tennessee Volunteer through and through, as she attended the University of Tennessee for eight straight years. She received her Bachelor of Science with Honors in Animal Science, and she continued her studies in Knoxville to receive her Doctor of Veterinary Medicine. While at the University of Tennessee, she was involved with HABIT (Human-Animal Bond in Tennessee) because she is fascinated by the love and support that is shared between humans and animals. She was the owner of HABIT’s first ever therapy guinea pig, and they would frequent the trauma floors at UT Medical Center to visit patients and help them feel better with some guinea pig cuddles. Dr. Davis also fell in love with veterinary dentistry, soft tissue surgery, and physical rehabilitation while she was in school, and she wants to continue to sharpen her skills in those interests. Dr. Davis knew that she was coming to Lakeland after graduation because her then fiancé, Trey, and beloved dumpster dog, Oscar, were already living there. She first found My Pet’s during her clinical year of vet school for a two-week externship (even acquiring a special needs kitten for her parents while she was here), and she is so excited to officially join the team! After graduation, she married that sweet man, packed up her nearly toothless kitty and four guinea pigs, and officially became a resident of the Sunshine State. In her free time, she loves baking, discovering new delicious foods, playing board games, re-watching “The Office”, and fitness kickboxing. 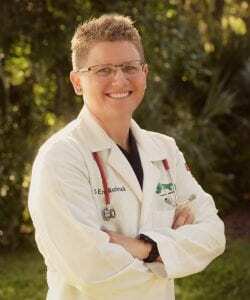 She is a member of the American Veterinary Medical Association, Florida Veterinary Medical Association, and Ridge Veterinary Medical Association.